Epididymis, Duct - Atrophy. 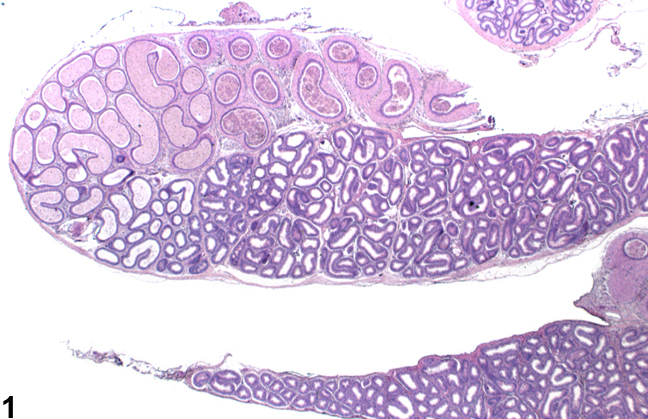 Decreased diameter of empty ducts in the body and tail of the epididymis in a male F344/N rat from a subchronic study. Epididymis, Duct - Atrophy. 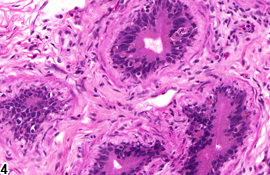 This higher magnification of Figure 1 shows the scalloped outline of reduced epididymal ducts in a male F344/N rat from a subchronic study. Epididymis, Duct - Atrophy. Empty, collapsed ducts surrounded by abundant mesenchymal tissue in a male F344/N rat from a chronic study. 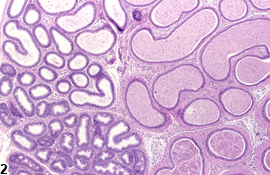 Epididymis, Duct - Atrophy. 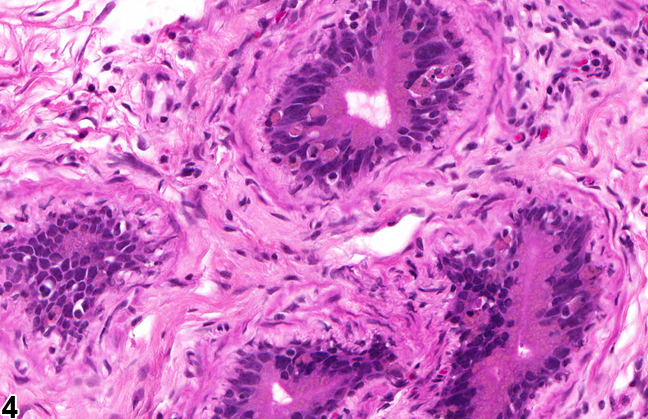 Higher magnification of Figure 3 showing collapsed ducts surrounded by myofibrotic mesenchymal tissue in a male F344/N rat from a chronic study. Atrophy of the epididymis is generally associated with decreased luminal sperm content, secondary to decreased testicular spermatogenesis. 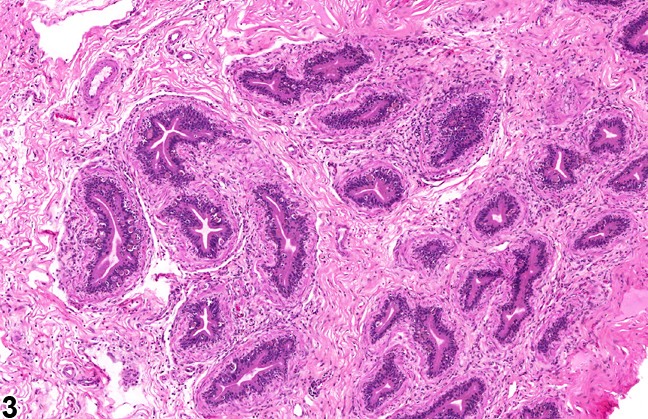 It is characterized by a decreased diameter of the ducts, resulting in intraductal folding of the epithelium to form a scalloped appearance. The interstitial stroma may also be increased ( Figure 3 and Figure 4 ). Atrophy can be diffuse or segmental. When segmental, it most commonly affects the corpus cauda junction. The epididymis is an androgen-dependent tissue, and atrophy can be seen in response to decreased testosterone, decreased dihydrotestosterone (e.g., 5α-reductase inhibition), or androgen receptor antagonism. 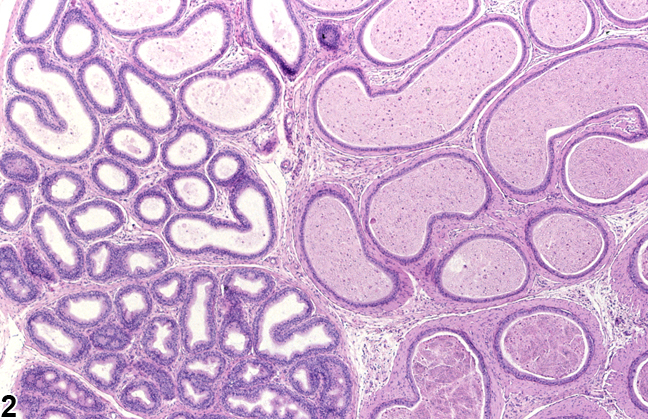 Epididymal atrophy is a common age-related finding that is associated with testicular degeneration/atrophy. Ductal atrophy should be recorded and graded and should be discussed in the pathology narrative if the incidence and/or severity appears to be related to chemical administration. If both epididymides are involved, the diagnosis should be indicated as bilateral and the severity based on the more severely affected epididymis. Correlation with disturbances in other male reproductive organs is recommended to aid interpretation. Klinefelter GR. 2002. Actions of toxicants on the structure and function of the epididymis. In: The Epididymis: From Molecules to Clinical (Robaire B, Hinton BT, eds). New York, Kluwer/Plenum, 353-370.